Born in Ogden, Utah, Lindsey Erin Larsen-Myer began her love for art, music and dance began at a young age, and her appreciation for beauty and grace came from her classical ballet training with the School of Ballet West. When she wasn’t dancing she was dabbling in paint or creating crafts. As she developed a passion for drawing, painting and sculpting, she began to win art competitions across the state, and was admitted to the Art Institute of Southern California in Laguna Beach, California where she studied fine art and graphic design for three years. 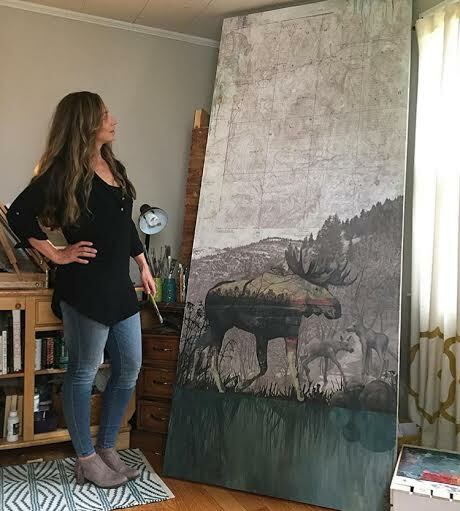 Lindsey completed a BFA in Art History at the University of Utah, while establishing herself as not just a artist but a graphic designer, she is know for her creative, authentic style and masterful use of color. Lindsey’s design and painting process is very meditative and done with pure intention. She believes that color can be inspirational and can function as a healing tool for our mind/body/sprit. Lindsey’s compositions may be seen as various metaphors’, which evokes another realm: that of simple architecture that reflects the organic and mathematical order and sequence of nature and, secondarily urban space. Substituting structure for color or light is a chief concern in her paintings and designs. Her colorful palette, unique and harmonious color combinations are essentially an attempt to balance and harmonize the human spirit. She says her inspiration comes by Rothko’s notion that the viewer can be enveloped by solid hues and colorful auras. In addition to her love for Contemporary Art, Lindsey has had an utter fascination with Picasso from a young age. Also equally important are the Renaissance and Baroque Masters. When Lindsey is not creating artwork, she is most likely to be exploring the world with her husband, (who is also an artist), hiking, writing and singing a song on the guitar or visiting museums, which she proclaims to be her dessert for the soul.